The compact Latch F/X System features a rounded safety latch design that prevents inadvertent release that can be caused by snagging gloves or jacket sleeves. The rugged leather skirting attached behind the drop-forged latch mechanism provides extra built-in comfort. The shoulder and lap belts are made of standard 3" military spec webbing. Belt adjusters include anti-slip spring. The compact integrated latch, link, and adjuster reduce size by 30%. This lightweight racing harness system was designed for maximum comfort and reliability at an affordable price. 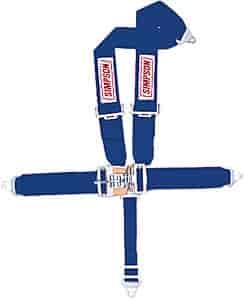 Note: ''Pull-Up Lap Belt Adjusters'' & ''Pull-Down Lap Belt Adjusters'' indicates the direction that tightens the lap belt adjusters. For example, a ''Pull-Up Lap Belt Adjuster'' is always the best choice in a Dragster. It is much easier, and safer, to tighten your belts in an upward motion (towards the latch) rather than a downward motion (away from the latch) because of the limited space.